Braun GmbH (/braʊn/ ( listen) "brown"; German: [bʁaʊn] ( listen)), formerly Braun AG, is a German consumer products company based in Kronberg. From 1984 until 2007, Braun was a wholly owned subsidiary of The Gillette Company, which had purchased a controlling interest in the company in 1967. Braun is now a wholly owned subsidiary of Procter & Gamble, which acquired Gillette in 2005. On 16 April 2012, De'Longhi bought perpetual rights to manufacture Braun branded products from Procter & Gamble in the small appliance segment. Procter & Gamble will continue to own the Braun brand. Max Braun, a mechanical engineer, established a small engineering shop in Frankfurt am Main in 1921. In 1923, he began producing components for radio sets. In 1928, the company had grown to such an extent, partly due to the use of certain plastic materials, that it moved to new premises on Idsteiner Strasse. In 1929, eight years after he started his shop, Max Braun began to manufacture entire radio sets. Soon after, Braun became one of Germany's leading radio manufacturers. This development continued with the launch of one of the first combined radio and record players in 1932. In 1935, the Braun brand was introduced, and the original incarnation of the logotype with the raised "A" was born. At the 1937 World's Fair in Paris, Max Braun received the award For special achievements in phonography. During World War II, Braun was compelled to more or less abandon products for the civilian sector. In 1944, the Frankfurt factories were almost entirely destroyed and Max Braun began to rebuild his company with 150 employees. The 1950s also marked the beginning of the product that Braun is most known for today: the electric shaver. 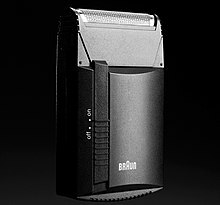 The S 50 was the first electric shaver from Braun. The shaver was designed in 1938, but World War II delayed its introduction until 1951. It featured an oscillating cutter block with a very thin, yet very stable steel-foil mounted above it. This principle is still used in Braun's shavers of today. The 1950s also saw the start of kitchen appliances, like the mixer MX 3 and the kitchen machine (Küchenmaschine or kitchen machine) Braun KM 3. The KM 3 is a family of food processors which started with the model KM 3/31 in 1957. Designed by Gerd Alfred Müller, these machines were built in nearly unchanged form for 36 years, until 1993. In 1962, Braun became Braun AG, a publicly traded company. In 1963, the company started distributing microphones by U.S. manufacturer Shure in Germany. Also during the 1960s, Braun created the Rams-designed T3 pocket radio. By this time, Braun's film slide projectors were featuring high-quality optics and all-metal construction combined with sleek functionalist styling, and competed with higher-end Eastman Kodak and Leitz products in the global market. Braun also started distributing in Germany high-end medium-format SLR system-cameras produced by Japanese camera manufacturer Zenza Bronica, as well as Braun-Nizo brand cameras and Super 8 film cameras (formerly of Niezoldi & Krämer GmbH; purchased by Braun in 1962). In 1967, a majority share of the company was acquired by the Boston, Massachusetts-based conglomerate Gillette Group. Erwin Braun, one of Max Braun's sons, took on the sales agency of the LECTRON system product line in 1967. He was very interested in making the teaching of electronics approachable to students all over the world. The LECTRON system was a simple but ingenious product which fit the bill perfectly. The LECTRON System was introduced to the German marketplace in 1966 by Egger-Bahn (a company primarily focused on the 9mm toy train sector). An electronic component such as a resistor was placed inside a transparent flat cube with a white cover on the top of which had the electronic symbol and its value. The blocks containing different components and types of connections could be put together to form a working circuit with the schematic diagram of the circuit illustrated by the symbols on the top of the block. The blocks were held together with the use of magnets behind the conductive plates on the sides and bottom of the block. In 1972, due to pressure from Gillette, the LECTRON assets were sold off to Manfred Walter, the manager of the LECTRON product line at Braun. Mr. Walter formed Lectron, GmbH in 1972 to continue selling and developing the LECTRON product line. Mr. Walter retired and gifted the LECTRON assets to the Reha-Werkstatt Oberrad in 2001. The RWO continues to manufacture and sell the LECTRON system to this day. By the 1970s, Braun had begun to focus on home consumer appliances, including shavers, coffee makers, razors, clocks, and radios. The company's line of film slide projectors and hi-fi products was discontinued. In 1998, Braun AG was transformed into a privately held company. In 1981, the company's audio and hi-fidelity division, which grew out of Braun's former core business of radios, turntables, and hi-fidelity audio products, was spun off into Braun Electronic GmbH, a legally independent Gillette subsidiary. Braun Electronic GmbH put out its last audio-fi set in 1990 before the business was discontinued. Also in the early 1980s, Braun sold its photographic and slide projector division to Robert Bosch GmbH. In 1982, Gillette Group moved to integrate Braun with the parent company by taking full control over its operations. In 1984, Braun ceased the production of cigarette lighters. That same year, Braun became a wholly owned subsidiary of Gillette. By the mid-1990s, Braun held a leading position among the world's home appliance manufacturers, but profitability concerns began to surface. Many of Braun's competitors closely imitated Braun designs and had them produced in low-cost labor countries at lower costs. The litigation commenced by the company to reverse the sales losses and damage to its product image cost Braun substantial amounts of money. In 1998, Gillette decided to transform Braun AG into a private company before it bought back a 19.9 percent share in its subsidiary The Gillette Company Inc., which Braun had acquired in 1988. The following year, Braun's sales organization was merged with those of Gillette's other business divisions to cut costs. At the end of the 1990s, Braun and Gillette suffered losses in several areas. Looking for ways to return to profitability, Gillette considering the disposal of some of Braun's less profitable divisions, such as kitchen appliances and thermometers, but abandoned the idea a few months later when no buyers were found. Braun's sales in those areas began to recover in 2000. Gillette was acquired by Procter & Gamble ("P&G") in 2005, making Braun a wholly owned subsidiary of P&G. In early 2008, P&G discontinued sales of Braun appliances, except shavers and electric toothbrushes, in the North American market. In Europe, however, Braun kept selling all its core categories until 2012, when the Braun brand relating to kitchen appliances was purchased by De'Longhi. The company was formerly a manufacturer of food processors, radios, slide projectors, Super 8 film cameras and accessories, and high-fidelity sound systems. Today, Braun focuses on its core categories (shaving and grooming, beauty and hair care). Household Small Appliances, Health and wellness category as well as clocks and watches are now run by other companies (De'Longhi, Zeon, Kaz) under licence. From the mid-1950s, the Braun brand was closely linked with the concept of German modern industrial design and its combination of functionality and technology. In 1956, Braun created its first design department, headed by Dr. Fritz Eichler, who instituted a collaboration with the Ulm School of Design to develop a new product line. In 1956 the company introduced its famous SK4 record player ("Snow White's Coffin"), designed by a youthful Dieter Rams together with the pioneer of system design, Hans Gugelot, then lecturer of design at the Ulm School of Design. Rams soon became the most influential designer at Braun. Rams was a key figure in the German design renaissance of the late 1950s and 1960s. Eventually becoming head of Braun's design staff, Rams' influence was soon evidenced in many products. Braun's famous SK 4 record player and the high-quality "D"-series (D25–D47) of 35mm slide projectors are some of the better examples of Functionalist design. Another 'icon' of modern design, but less well known, is the electrostatic loudspeaker unit BRAUN LE1, the electronics were licensed from QUAD. Dieter Rams and Dietrich Lubs are also responsible for the classic range of Braun alarm clocks, collaborating first on the AB 20 in 1987. These designs were discontinued by Braun in 2005. For nearly 30 years Dieter Rams served as head of design for Braun A.G. until his retirement in 1995 when he was succeeded by Peter Schneider. Many of his designs—sleek coffee makers, calculators, radios and razors—have found a permanent home at the Museum of Modern Art. In the 1970s, a design approach influenced by pop-art began to inspire Braun products, which by this time included many common household appliances and products. Contemporary Braun design of the period incorporated this new approach in bright colors and a lightness of touch, while still clean-lined in keeping with Functionalist philosophy. Headquarters of the company in Frankfurt am Main, 1960. Braun SK61, nicknamed "Snow White's coffin"
^ Slide projectors produced by Braun AG must not be confused with the Paximat and Novamat slide projectors produced by Carl Braun Camera-Werk, a different and unrelated German company, up to the present (2014). ^ "Press Release" (PDF). investors.delonghi.com. 2012-04-16. Retrieved 12 March 2013. ^ "Bye, Bye Braun". foodandwine.com. January 30, 2008. Archived from the original on December 6, 2008. ^ 1952-, Polster, Bernd, (2005). Braun : 50 Jahre Produktinnovationen. Köln: DuMont Literatuar und Kunst Verlag. ISBN 3832173641. OCLC 69982458. Wikimedia Commons has media related to Braun (company).